Some of the old fashioned favorites have never gone out of style, take Deviled Eggs for example. Eggs can be a nutrition powerhouse and recent studies show that having one or two eggs daily as part of a healthy diet does not raise blood cholesterol for most people. 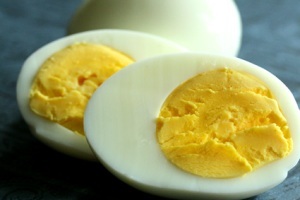 Have you ever made hard-boiled eggs, where the yolk has a dark greenish hue? Well, it ain’t easy being green, so here’s the right way to hard boil eggs. Swap that unsightly green ring around the yolk for eggs that are appetizing to the eyes as well as the mouth, with yolks that are fluffy, golden, and soft. Place four large eggs into a small saucepan filled to the top with cold water. Place over high heat. As soon as the water comes to boil, cover and take off the heat. Set aside for 15 minutes. Transfer the eggs to a colander and rinse under cold water 1 to 2 minutes. Cool to room temperature and peel. Mix yolks, mayo, yogurt, mustard, paprika in a small bowl. Mix until smooth. Spoon back onto the egg whites and sprinkle with paprika and chives. Mix yolks, mayo, yogurt, green onions, and salt in a small bowl. Mix until smooth. Spoon back onto the egg whites and sprinkle with bacon. Mix yolks, jalapeños, sour cream, and salt in a small bowl and mix until smooth. Spoon back onto the egg whites and top with salsa. Great recipe again! I like adding a little sweet pickle relish, to taste (since I never measured to be honest). Gives an even more sweet/tangy flavor.